Dr. Harry Coover discovered the material Cyanoacrylate in 1942. He was searching for a substance to use on a clear gun sight for a rifle. Cyanoacrylate was unsuited and ill-equipped for the purpose. It literally stuck to everything it came into contact with. And it bonded with incredible strength. Over seventeen years later, Dr. Coover would reintroduce this material to the public with the Eastman Chemical Company. The product was called Eastman 910, what we now refer to today as Super Glue. Super Glue has been used over the years in a multitude of ways. Advertisements contained demonstrations of its amazing strength. Super Glue was even used during the Vietnam War, saving the lives of soldiers with gaping wounds in the field of battle. Just two years ago, a manufacturer named Loctite tested its limits. With just nine tiny drops of Super Glue, they were able to lift a pickup truck with a Mini in its bed, a total of 10,000 pounds. A small amount of glue has the ability to make a big difference. I believe there is another type of glue that we can utilize to transform business. Like Cyanoacyrlate, it’s also a little thing that has the power to wield a great effect. This G.L.U.E. 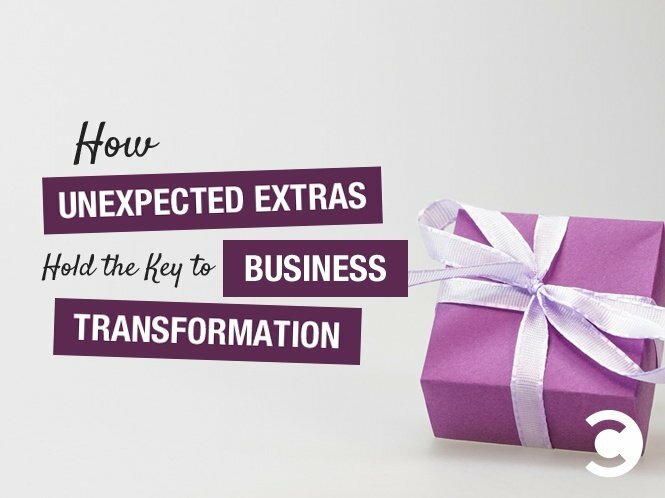 is an acronym that stands for, “Giving Little Unexpected Extras.” It’s the little bit extra done by a business in order to exceed the expectations of its customers. It’s that signature something that goes beyond the transaction. It’s the little tangible thing that demonstrates that you care for the customer. This concept of giving little unexpected extras isn’t new. Dating back to the early 1800s, its origin is in a creole word called lagniappe. 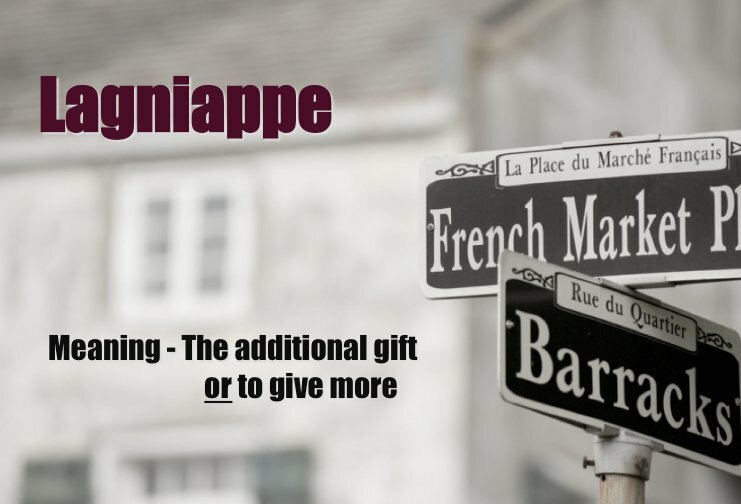 Deriving from French and Spanish, lagniappe means “the additional gift.” It’s that something extra that is added for good measure. I call these examples of G.L.U.E. Purple Goldfish. 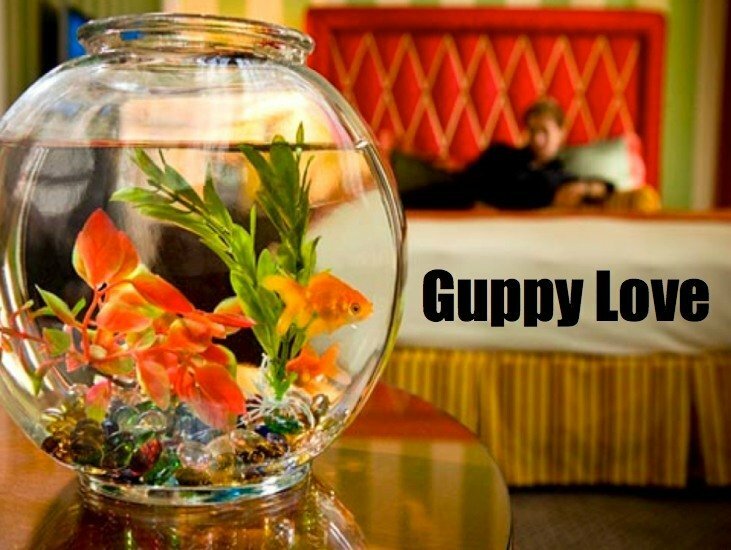 Why purple and why a goldfish? Purple is a direct reference to New Orleans because of lagniappe. Purple, green, and gold are the three official colors of Mardi Gras. Over the course of 27 months, I was able to crowdsource 1,001 examples of Purple Goldfish. These examples became the basis of my first book What’s Your Purple Goldfish and a recent TEDx talk in Douglasville, GA. I challenge you to hold up a mirror to your business. How are you giving little unexpected extras for your customers? Are you giving them something to talk about, tweet about, or post to Facebook about? What signature things help your business stand out in a sea of sameness? Are you doing the little things that can make a big difference? Are you ready to G.L.U.E? Paying It Forward: Paying it Forward is one of the 12 different types of Purple Goldfish. One of the stories in my TEDx talk featured Theresa Cook and Panera. In honor of the memory of Theresa and to shamelessly ask you to plug this, I am going to give $1 per share of this post by June 29, 2015 (up to 1,000 shares) to the Lustgarten Foundation for Pancreatic Cancer Research. Lagniappe: I’m making my eBook Purple Goldfish free today, June 22, for download on Amazon. Click here to download your copy. Stan Phelps is the founder of 9 INCH, a consultancy that helps brands obtain customers that are up to four times as valuable as ordinary customers. He’s the author of the Purple Goldfish, Green Goldfish, and the Golden Goldfish. He works with senior leaders to focus on meaningful differentiation to win the hearts of both employees and customers. Driven by client objectives and inspired by bold vision, Stan creates custom keynotes, workshops, and programs that are memorable and on brand, inspiring businesses to become REMARK-able by design.